Jane Haworth lives in Auburn, CA with her tolerant husband and young son. They have no pets—just sewing machines to take care of. Jane has turned their house into a creative space for writing and sewing. The Haworths, including their two college-aged daughters, moved from England in 1998 and have settled well into a California lifestyle. memory quilts for American and international clients from her online shop on Etsy.com, called Quilts from Clothes. Her one-of-a-kind art quilts are made using a raw-edge, collage, appliqué technique using a variety of hand-dyed and commercial fabrics and other unusual materials that she tirelessly collects. 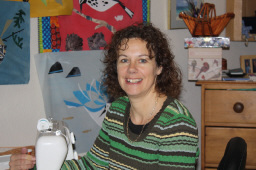 She also lectures about quilting and teaches kids and adults to sew and quilt. 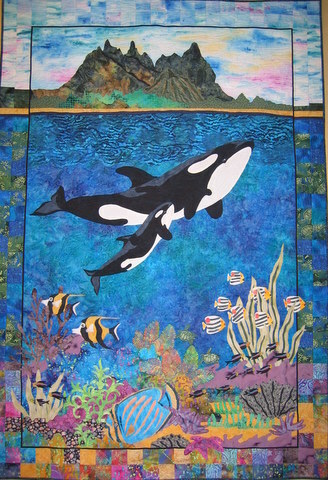 She has exhibited her quilts at many of the major venues around the United States including the International Quilt Festival in Houston. Her quilt-related articles and work have been featured in various quilting magazines including Quilting Arts, Modern Patchwork, and Quilters’ Newsletter. Her quilt “Nameless Afghan Girl” was featured on the cover of the Notable Women Exhibition Catalogue. Jane’s presentation on October 8 is a lecture/trunk show begins with a short photo tour of Britain and Jane's early, varied career in the textile field. It covers the trials of teaching herself to quilt and how she has gone on to make unique, raw edge appliqué quilts that have been exhibited throughout the US. She will also talk about her Etsy shop and t-shirt quilt making. Jane is an active member of Foothill Quilters Guild and designed our 2018 Opportunity Quilt. Have fun working on a one-of-a-kind portrait of your pet. 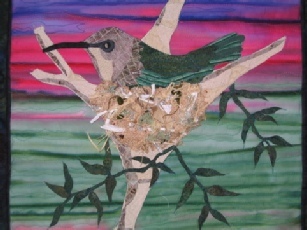 Learn an addictive raw edge collage appliqué technique while creating a one-of-a-kind animal wall hanging. 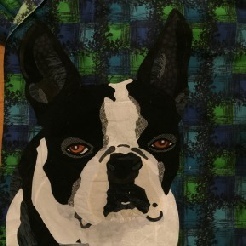 In this one-day class, using no fusible, layer, trace, cut, and glue fabrics in a fun, no-mistakes way. Join Jane to learn about making the best fabric choices, how to use values to enhance your portrait, and then get tips for free motion quilting. The class uses a 200% photo enlargement to work on as your pattern.